Runway: 12/30 - 1200x30m - grass (landings were usually made according to the wind). 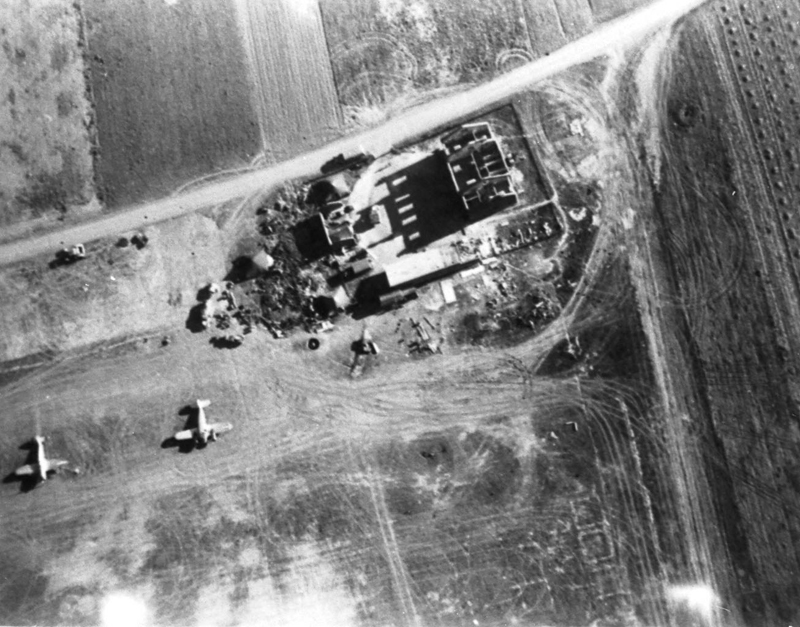 Condé-Vraux airfield (French: aérodrome de Condé-Vraux) was an airfield located 140 kilometer east of Paris. 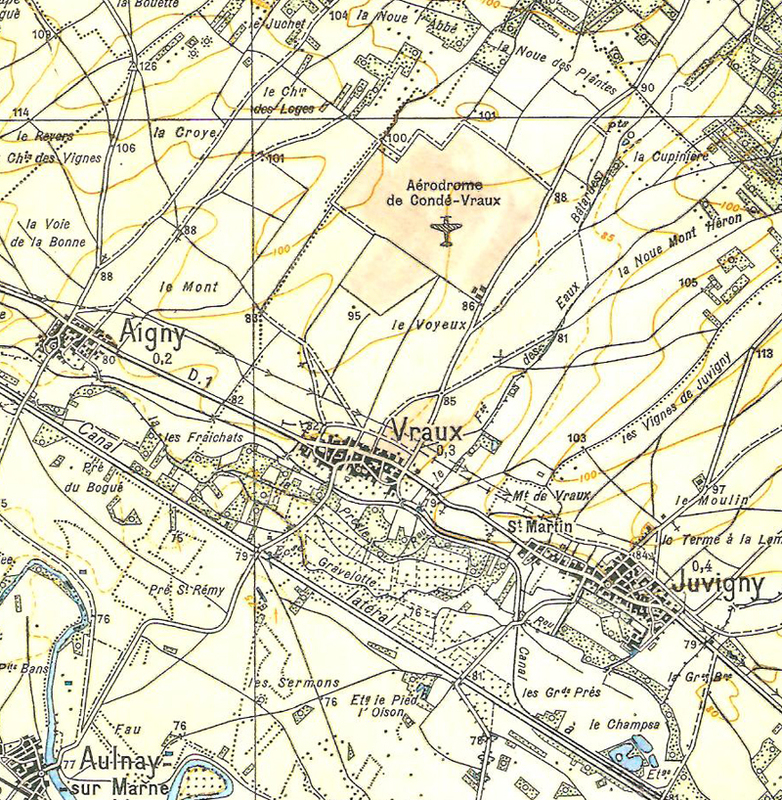 Originally planned as a relief landing ground for the air base at Reims, the Vraux site was chosen along with fourteen other locations by the Regional Directorate of Engineering METZ (Engineering Headquarters for Chalons/Marne) on behalf of the Armée de l'Air (French Air Force) as early as October 1935. Construction of the field lasted from October 1936 to end 1937. Code named "Maison Rouge"(Red House), it became home to a reearch facility for the development of reconnaissance photographs. By prefectural order dated 10 February 1939, the land was made available to the Army for a period of 5 years (1939-1943). The airfield was declared operational on 3 September 1939, the day of the declaration of war on Germany. A few days earlier, on 30 August 1939, its air wing consisting of 145/111 and commanded by Lieutenant Wantz, arrived from Mourmelon air base (Base Aérienne 111). Situation map of the airfield in the 1930s (via Gérard Faux, Vraux airfield museum). Agreements to send English fighter and attack squadrons to north-eastern France in case of conflict were signed between France and England in September 1936. As a result of this agreement and the declaration of war against Germany, the airfield also hosted RAF detachments, supplying them with food, fuel and security. They were part of the Advanced Air Striking Force (A.A.S.F. ), the air component in support of the British Expeditionary Force. XV Sqn, operating Fairey Battles, flew from the airfield between 12 September 1939 until 9 December 1939. The squadron was withdrawn to Great Britain to reequip with more modern Bristol Blenheim Mk.IV attack aircraft. 16 twin engined Blenheims arrived at Vraux with 114 Sqn that same day and remained until 16 May 1940, conducting bombing training exercises and a number of reconnaissance missions over Germany. During those missions, its aircraft were often faced with Messerschmitt Bf109 fighters and they frequently returned to Vraux damaged. On 27 February, Pilot Officer H. Dodgson was killed in command of Blenheim L 8838 in a low-altitude flight. His was the first death, although his two crew members were safe. Other deaths followed: Pilot Officer Farrow and A.C. Sanders were killed during a night flight on 2 March 1940 and Sergeant Williams died in an accident on 6 March. On 10 May 1940, the day of the invasion of Holland, Luxembourg and Belgium and the outbreak of the blitzkrieg, 114 Sqn was on mission in Perpignan. They were recalled to Vraux urgently and ordered to prepare for battle. At 6:30AM on 11 May, groundcrews began warming the engines of the 16 Blenheims for a bombing raid against the enemy armies. Suddenly nine Dorniers Do-17Z in low-level flight appeared; part of 4./KG2 of the Luftwaffe, they dropped their bombs on the airfield, aircraft and facilities. Soon, the sixteen Blenheim were destroyed or badly damaged and the fuel depot no longer existed. An observer on board of one of the Dorniers, Werner Borner, filmed the attack on the airfield with an 8mm camera. This film would be presented to Hitler by General Loerzer, Commander of Luftwaffe, as evidence of the effectiveness of the bombing at low altitude. After the attack and without servicable aircraft, 114 Sqn began to clean the ground of the many unexploded 50kg bombs that were dropped from too low an altitude. That evening, two planes arrived to replenish while crews without aircraft joined 139 Sqn at Epernay-Plivot to fly combat missions. Those consisted of reconnaissance and bombing missions in the quadrant northeast of Reims, monitoring the advance of German armies. Several aircraft would be shot down with their crew missing. On 16 May, the squadron was ordered to prepare to leave the field. 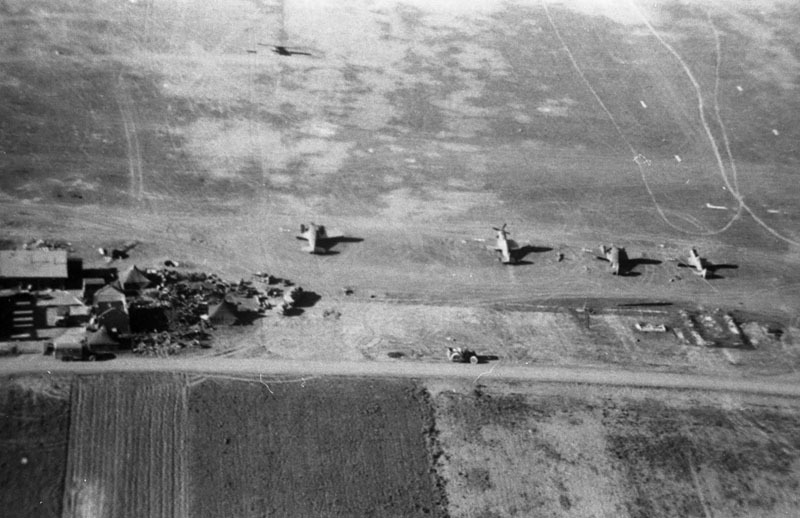 On the 17th, Hurricane fighters of 1 Sqn from Berry Bac landed at Vraux. They spent the night there and the next day took off again towards Anglure. On 18 May, the Curtiss H-75 of Captain Ghieu belonging to squadron GC2/4 Diables Rouges ("Red Devils") arrived at Vraux damaged, after a dogfight with a Bf109. He was greeted by the members of 114 Sqn. After his plane was repaired the next day, he rejoined his unit at Orconte. On May 19, 114 Sqn withdrew all its aircraft by air, first to Crecy, then on to Nantes, from where they withdrew to England on May 27. Just after their departure on the 19th and again on 20 May, the airfield and the village of Vraux were again bombarded, this time by Stukas of the Luftwaffe. 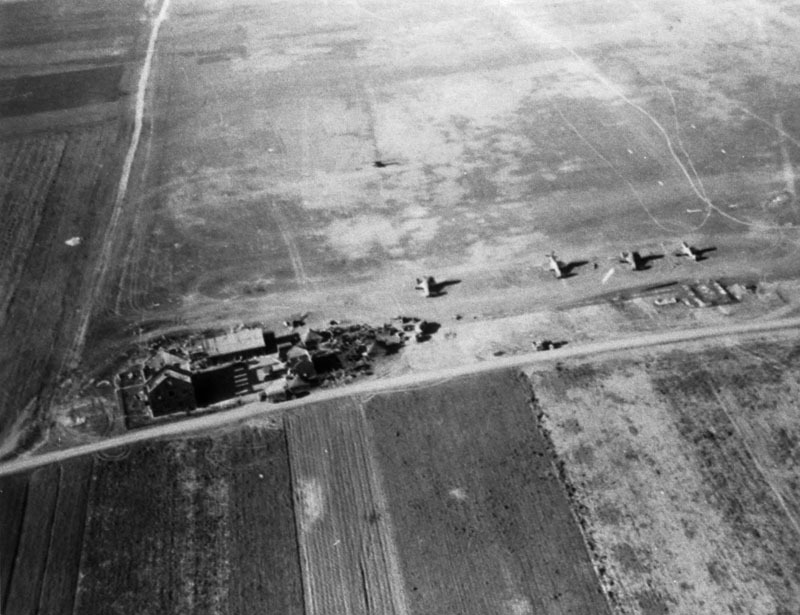 During the occupation, the airfield at Vraux remained largely quiet. The Luftwaffe used it occasionally, although Ju-87 "Stuka", Ju-52/3m, Fieseler Fi-156 Storch and Bf109 had used it during the Battle of France. After the battle, the Germans used Vraux as a relief airfield and firing range. In June 1944, they refurbished the runway and infrastructure. They installed an electric night landing system. Bf-109Gs, concealed in revetments formed in the surrounding woods, used this runway. They stayed there until July 1944, the date of their withdrawal caused by the Allied advance, especially that of U.S. General Patton's Third Army, who liberated Vraux on 29 August 1944. Rebuilt and codenamed Y-45, the field was returned to service for use by USAAF. Until May 1945, it would be used by aircraft of the XIX Tactical Air Command, Ninth Air Force, providing air support, refueling and command support of Patton's Third Army. All sorts of aircraft could be seen, such as Skytrains/Dakotas, a Cessna AT-8/UC-78 Bobcat, P-47 Thunderbolt, Piper L-4s, etc. 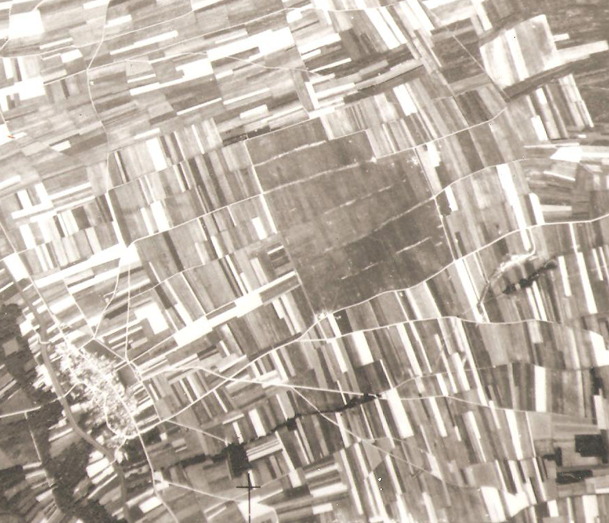 1944 Aerial photo taken by USAAF (via Gérard Faux, Vraux airfield museum). The end of World War II also meant the end of the airfield. The lands were returned to their origins: agriculture. The former owners of plots of land would recover plots of land from the military. By November 1955, everything had returned to normal. Since, the only remaining witness of Vraux aeronautical past, the Maison Rouge ("Red House") still stands guard alone in the field. Memories of the airfield are still present in the village of Vraux, as can be witnessed from the inscriptions left by the British and by pieces of duralumin that farmers found during their plowing of the fields when they worked "at the camp."